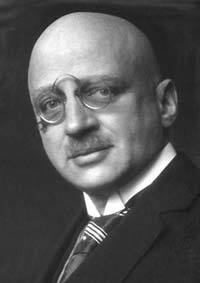 Fritz Haber was born in Breslau, Germany in 1868 in one of the oldest families in town. His father, Seigfried Haber, was a very prosperous chemical merchant at that time. His schooling was at the St. Elizabeth Classic school in Breslau where he did various chemical experiments during his study period. From 1886 to 1891, Fritz Haber studied at the universities of Berlin, Heidelberg, and Zurich. Haber worked for his father before starting his own career in research. Later, he left his father’s business and started doing research at the University of Jena in organic chemistry. In the year 1894, he was offered an assistantship by Hans Bunte, the professor of chemical technology at Karlsruhe where remained till 1911. Haber worked with Hans Bunte who was interested in combustion chemistry. Carl Enger, who was also there, introduced Fritz to the study of petroleum. These two colleagues greatly influenced Fritz Haber’s subsequent research works. Fritz developed the process of nitrogen fixation in close collaboration with industry. He also designed and developed a number of analytical instruments like a gas interferometer and an instrument that would warn against harmful accumulation of methane gas in coal mines. In 1911, Fritz moved back to Berlin to join the Kaiser Wilhem Institute of Physikalische and Elecktrochemie. During the fall of 1914, WWI started and Fritz was called upon to help in the war efforts. Fritz assembled more than 150 scientists and 1,300 technical people to develop tools for gas warfare and, at the same time, also developed countermeasures like gas masks. Due to his research works, the acute toxicity of inhaling various poisonous gases was identified, which led to the development of countermeasures and effective methods of treatment against gas toxicity. Fritz invented a large scale synthesis of ammonia from nitrogen and hydrogen gas, for which, in 1918, he was awarded the Nobel Prize for developing the process of ammonia synthesis. However, Haber was considered a villain by various scientists due to his invention of poisonous gas. Many of them vehemently objected to his award of the Nobel Prize. They called it “undiplomatic” and “ill-devised.” Even some award winners declined to receive their awards that year. Between the time of the two world wars, Fritz attempted to help Germany recover from all its debts by conducting experiments to extract gold from sea water. However, Haber discarded the project due to the small quantity of gold obtained through the process. Fritz received a number of honors for his research works apart from the Nobel Prize. He died in 1934 due to a heart failure in Basle.